E file Taxes Online & Save - HBS Financial Group, Ltd.
(GAL) – Even today, when shopping online with a computer is so commonplace, many are still reluctant to e file taxes online for the first time. As soon as they take that first step, however, and see just how easy it actually is, their fears are soon put aside. Online tax filing has come a long way over the past few years. 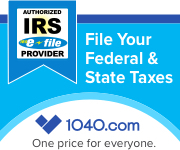 A good online tax preparation program, such as ours at 1040.com, will lead you throughout the entire process. We use an interview type program that lets you answer a few simple questions. From your answers to the questions, the highly intuitive program is able to determine the type of return and schedules that you are required to file. A good example of this amazing ability would be if you had income from a rental property to report. The program knows the appropriate questions to ask, such as when you bought the property, how much you paid for it, etc. It would also ask what the breakdown is on land cost and cost of the buildings, and would be able to set up the depreciation schedule for you. From your answers to the questions, it would also know if the property was a residential or a commercial rental. There are many other expense items that you would enter to complete this schedule. There are numerous benefits when you e file taxes online. Within a few hours of e filing, the Internal Revenue Service and your resident state will send back an acknowledgement. This will advise you that they have received your returns and have accepted them for processing. Filing a paper return is never that documented. Plus, when you e file taxes online, and the return is accepted, you know that it has been filed without math errors and no typos with your social security numbers. You know also that you are helping with the Green Program as no paper is used in sending your returns to the IRS and your state. Everything is stored electronically and no human intervention is done unless your return is pulled for further review on some item. As soon as your return is completed, our program gives you the opportunity to review. You need to double check the data entry that you made from your tax forms so that you can file an accurate return. You’ll also know if you have a refund or if you will owe additional taxes. At this point, you pay for your return and now you are ready to e file taxes online. The IRS has been placing a lot of emphasis the past few years, on e filing. Their ultimate goal is for 100% participation, and most states are in agreement. Filing taxes online is so much better that filing a paper return, and much safer. We highly recommend this method. Use your last year’s return as a guide and gather all of the tax records and information for the current year. Follow the simple interview process in our program and you will be able to file an accurate return. You’ll receive an accuracy guarantee, among others, when you e file taxes online with us. The number of individuals taking advantage of online tax filing is increasing each year. They see the many benefits and are convinced this is the best way to file their taxes. Most of the online tax filing vendors, including ours, use the same type of software program. The lower fees come from the vendors that have a simple and a two tier structure, such as ours. Compare the prices and see where ours stands out. So, please don’t delay, e file taxes online with us and receive fast refunds at a low cost. Click here and give our program a FREE test drive…you’ll like it! I gave your program a test drive a couple of months ago and it did very well. Besides being easy to use, your prices are lower. Thanks for a good post. Glad you like our program Nicole and hope to see you return when you receive your tax forms. I have several rental properties, and your program knew what questions to ask. I used Turbotax last year, and their fee for my type of return was over twice the amount you charge. You have a new and loyal client from now on. Thanks for your comment David and we look forward to your return. My husband and I were members of that group, that is, being reluctant to efile our taxes online. Our taxes aren’t that complicated, but we had been going to Block for a number of years. Their prices are very high, so we decided to give you a try. We used your program last year and I couldn’t believe how easy it was. Your low cost for filing was also a big plus. See you in a few months. Thanks for you comment and kind words Abby, it’s really appreciated. Looking forward to your return in a couple of months. My husband recently passed and he had been taking our tax returns to an accountant over in the shopping center. One of my neighbors told me that she has a fairly easy return such as mine and had been filing them online for several years. I took a look at your site at 1040.com, and it looks straight forward to me, so I decided to give it a try this coming year. If I need help, there were telephone numbers and e-mail addresses on the site. Thanks Audrey. Yes, if you have a question or a problem when you’re filing on our online site, pick up the phone for fast and efficient help.